"Make sure the tomatoes are all approximately the same size and not overripe; firm tomatoes will yield good-looking results. This is a family favorite, and whether I make it as an appetizer or a side dish,, there is never any left over." ~ Lidia Bastinaich. 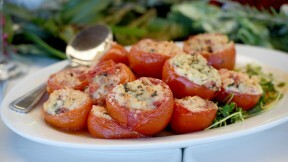 Stuffed Tomatoes (Pomodori Farciti al Forno) are featured in the Homegrown Heroes episode of Lidia Celebrates America. Preheat the oven to 400 degrees. In a medium saucepan, bring 2 cups water to a boil, with ½ teaspoon salt and the bay leaves. Stir in the rice and 1 tablespoon of the olive oil. Bring to a simmer, and cook, uncovered, until the rice is al dente and the liquid is almost all gone, about 10 minutes. Remove any leaves. Scrape into a bowl to cool. Slice the tops off the tomatoes, reserving them for later. Gently scoop out the inner flesh of the tomatoes with a spoon, leaving the shell intact. As you work, put the flesh in a strainer set over a bowl to collect the juices. Once all the tomatoes are scooped out, season the insides of the tomatoes with ½ teaspoon of the salt. Chop the collected tomato flesh, leaving the seeds behind, and put in the bowl with the rice. Add the mozzarella, ham, ½ cup of the grated cheese, the basil, the oregano, and the remaining ¼ teaspoon salt. Toss to combine. Pour the strained reserved tomato juices into the bottom of a 9-by-13-inch baking dish. Evenly divide the stuffing between the tomatoes. Arrange the cut-off tomato tops in the baking dish, cut side down, and place a stuffed tomato on each top. Depending on the size of your tomatoes, you may have a little leftover stuffing. If so, roll it into “meatballs” and place them between the tomatoes in the baking dish. Drizzle the tomatoes with remaining tablespoon of olive oil, and sprinkle the tops with remaining grated cheese. Bake until the tomatoes are soft and juicy and the stuffing is browned on top, about 20 to 25 minutes. Serve hot or at room temperature. This is a great dish for buffet tables.